The California School Dashboard, which debuted in early 2017, is the state's primary way of summarizing and communicating the "performance" of schools, districts, and groups of students. Some of the data on the dashboard is assembled through state data systems, and insiders call these "state" indicators. The dashboard also includes "local" indicators, which we explain in a different post. Broadly, the state-managed indicators on the Dashboard represent two things: current results ("status") on student outcomes such as test scores; and progress or the lack of it ("change"). As mentioned in prior posts in this series, the California State Board of Education has established "cut points" for both status and change to define levels of performance. We'll take this step by step. In order to assess a performance color, imagine that each indicator on the Dashboard begins by stacking the five levels of status vertically. Red (poor results, or "very low" status) goes on the bottom. Blue (great results, or "very high" status) stands on the top. The dividing lines between the colors are the Board's "cut points." 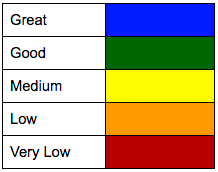 Each indicator also orders the five levels of change. Backward progress or weak progress goes on the left. Rapid improvement goes on the right. The horizontal lines in the table above represent cut points in status. The vertical ones represent cut points in change. There is a 5x5 color table for each of the state-defined indicators. In the following posts we explore these indicators and how you might want to use them. Although the boxes in the grid above appear to be the same size, it's worth knowing that some performance levels are more common than others. The distribution of colors varies significantly by indicator. For example, yellow is the most common performance level for the English and Mathematics indicators, but blue is the most common for high school graduation. 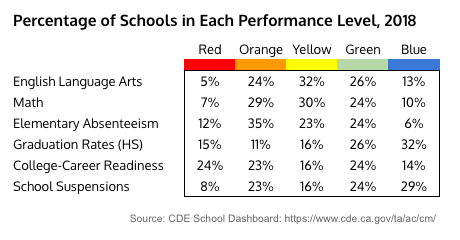 The percentage of schools in each performance category for each indicator in the 2017-18 school year is summarized in the table below. This distribution is not fixed, and could improve. In the top right hand corner of a school or district Dashboard you will see a purple button labeled "View Additional Reports." It takes you to a menu that enables you to see the 5x5 grids for all the state indicators. These grids also explain how each of the schools in a district or student subgroup in a school performed. The performance grids are almost always 5x5, but there are exceptions. For example, when the number of individuals involved is so small that privacy could be compromised, the state sometimes scrunches the grid to 3x5. At the risk of being obvious, the dashboard is designed to support a system that is basically consistent from year to year. When there is a big change, the dashboard cannot calculate performance. For example in the 2018-19 school year it was not possible to determine performance colors for English proficiency because the underlying tests were changed from the CELDT to the ELPAC. In-depth documentation of the California School Dashboard is available from the California Department of Education. The full documentation includes all the details. Updated March 19, 2017 to include analysis of the percentage of schools in each performance category. Updated in December 2018 and January 2019. This post is part of a series about the California School Dashboard.